Trust is essential in business, leadership, and relationship. But what happens when you lose trust. What do you do next? I have a great interview with Stephen M.R. Covey about how to regain trust. This message is not just for leaders or even just business people. 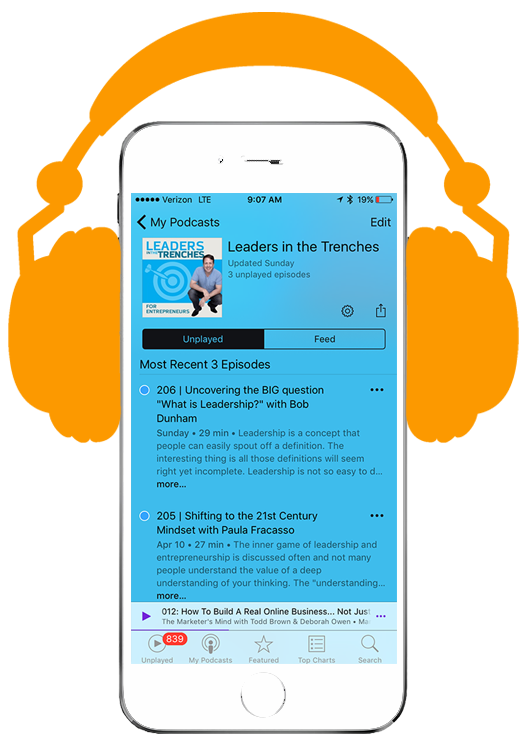 Listen in for Stephen’s insights on how to regain trust. 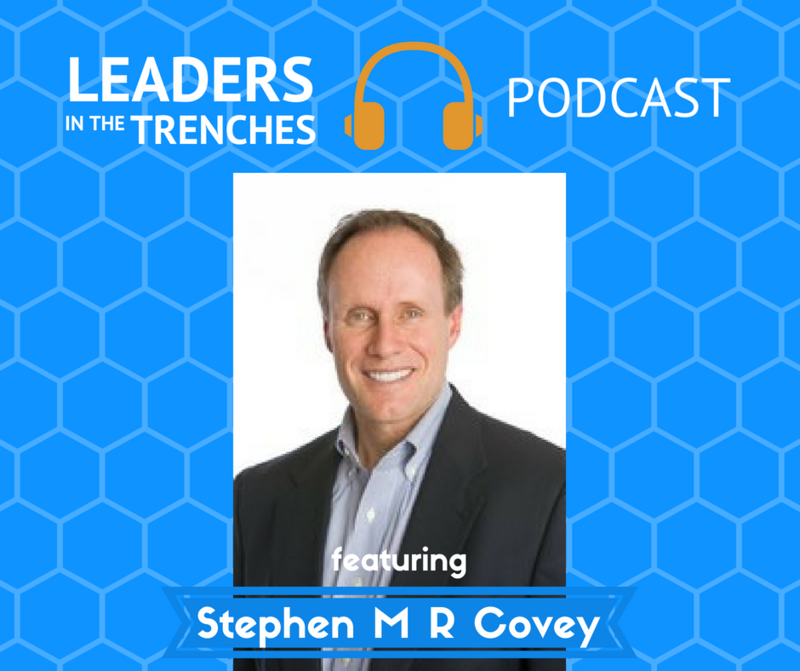 Target Audience: Stephen is a co-founder of CoveyLink and the FranklinCovey Global Speed of Trust Practice. A sought-after and compelling keynote speaker and adviser on trust, leadership, ethics, sales, and high performance, he speaks to audiences around the world about trust and how to regain trust. Hi, this is Gene Hamment. I’m with leaders in the trenches. My question for you is how do you regain trust? We all have had those situations where we have had trust broken on us or with us, but how is the right process or how do we actually go about regaining trust? I will tell you that once it is regained, you could actually build a deeper relationship, but you don’t want to do that on purpose because what happens is they don’t allow you the chance to rebuild it. Now, when we talk about trust, I really thought about who should I have in this conversation? Well, there is a fantastic author of a book called the “speed of trust” and that Stephen Mr. Covey. You may have heard the name before because Stephen Covey has been around for ages, but don’t get confused with his father or the seven habits for highly effective people. Sorry, I misspoke there. So that book has changed so many people’s lives and the basis for this work on trust came from Steven. Mr. Covey, his son working with him on getting that message out into the world. So we talk about how to regain trust and we talk about the specific five steps that you can take to do it for yourself. So stay tuned for the interview here at leaders in the trenches. Gene: Hey Stephen, how are you? Stephen: Hey, doing great Gene. Great to be with you. Gene: Well, I’m excited to have you here. This is when I got an email in from your team and, and I get a lot of emails. I go really? Stephen Covey wants to be on my show. Is that for real? So I’m really excited to have you here. Stephen: I’m honored to be here especially because of kind of your whole approach, you know, leadership in the trenches and so gaining real practical with this and that’s kind of what I’ve been trying to do with trust is, is to get real and practical with it. So I think it’s a great fit. I mean, what you’re doing, what I’m doing. Gene: Well, you’re carrying on a lot, you know, big shoes to fill. And I’m sure you’ve heard this before, give us a little bit of background on where the core of this essence came from years ago. Stephen: Yeah. You know, it’s interesting because, uh, you’re referring to my father. He wrote seven habits of highly effective people and I helped my father build at the company that took seven habits throughout the world. And, um, it was pretty exciting and I’ll tell you why. It was in that process of doing that. And I started to see how trust changed everything. Not In small incremental ways, but in profound ways, in economic ways that whenever it’s high trash you can move faster with less cost and there’s low trust that cost more. And it took you longer. And I came to the conclusion that there’s economics to trust. It’s not just a social virtue is the next show. You can put a price tag on it. It affects this speed. Once you’ve removed the cost of everything. And once I saw this, I began to see it everywhere else in relationships with suppliers, distributors in with customers, with our own people, that there’s an economic success. There’s a speed to trust and nothing is as fast as the speed of trust and so it kind of grew out of the work that I did with my father as we took seven habits throughout the world and we build an organization. I saw the economics of trust playing out everywhere. And the insight was that press is not just social, everyone knows it, it’s social, it’s also financial, it affects speed and cost and you can put an economic value on that. Stephen: And suddenly tresses moved from a soft kind of Nice to have social virtue into a hard edge economic driver where everything happens faster with less cost. And that was a big idea. There’s a speed to trust. Gene: Well, I love the fact that it comes from the work that you did to her dad because I didn’t know that part of the story because that book has changed a lot of people. I mean, I’ve gone and talked to people and I’m not sure which one it is, but, you know, seek to understand is one of the things I have to live by within my work. Um, does that number three, number five. So you took, you took the message with your father out there. I mean, can you remember an example where it kind of really zeroed in on, on where trust was such an important piece to do the work you guys were doing? Stephen: Yeah, absolutely. I’ll give you one illustration. Stephen: One time we were working with the two different suppliers, you know, for this a key product and, and um, and I was brand new is, is a CEO coming into the situation and with one supplier we had high trusts. Everything worked great with the other supplier. It was hit and miss farmers body lower trust. And I remember, um, you know, we had to put in place all of these processes, redundant systems to make sure that with the less trustworthy supplier that everything would work out. I remember saying to my team, well, why are we even working with the second folks, you know, the second team because we can’t even rely upon them. They said, well, we got to have a redundant source. I’m going to have two sources. And just in case. And I said, well, who’s paying for all this? All this extra checking and verifying and validating. And they said, well, what we are, because if we don’t, we’re too vulnerable but could happen. And it just dawned on me like, goodness, there is a high cost of low trust and then I started to see it everywhere that whenever the trust went down in relationships on teams, between teams, with partners, everything took longer, everything costs more. We had to take all these steps to compensate for it. That is a tax is a low trust tax. And I began to see it everywhere and then we applied it inside the team, inside the organization with a part with customers, not just with suppliers, distributors and the economics played out everywhere. And you could, it, uh, you know, look what happened after nine slash 11 with airplane travel or trust or confidence goes down. We can’t have that. So we increased security, it helps, right? Stephen: But it comes at a price that takes longer, costs more. Same thing with all kinds of, you know, the big scandals. We had a decade plus a decade or so ago with that Enron, Worldcom. You lose trust in public companies. You can’t have that. They put in place Sarbanes Oxley and other acts that compensate with a lack of trust. It helps, but it takes longer. It costs more. There’s a high cost of low trust, but the converse is equally true. Then the trust goes up and the relationships on the teams and the cultures between partners. When the trust goes up, speed goes up with it. Everything happens faster. The cost comes down to cost you this. And that is a dividend. So low trust is that taps high trust is the dividend and it plays out everywhere and you can actually put an economic value on it. And once you have that paradigm to start to see it everywhere. And I look at Warren Buffett operating with high trust, doing deals on a handshake without the traditional due diligence, you know, enormous speed, low cost, high efficiency, speed of trust and action. And, and so that was the paradigm. And then I began to see it everywhere. And, and, uh, and it, it really, it really changed my whole way of approaching business as a leader and also then as it began to work with other organizations to recognize this, get the economics of trust work before us, not against us. Gene: Well, I really love the conversation here. I mean, trust is something that all leaders are thinking about, especially as we’re building cultures. Um, and we’ve been, this is pretty high level, so I want to, I want to dive deep and I know that this is something you probably already do. I mean, we’re talking to the guy who’s written the book on this, the speed of trust and um, I want to dive deep in with a couple of things that were on my mind when trust is lost. What are the key things that we need to be focused on as leaders or as individuals that want to regain trust with, with one particular person? Stephen: Yeah, great question. Because it’s the biggest challenge that most of us have at some point. We’ve lost trust somewhere or our team has, our company doesn’t, can you restore it? So here’s the key principle. Gene, you can’t talk your way out of a problem that you behaved your way into, you know, so we lost people was trust, become a because of our behavior. Words alone won’t get it back. We have to behave our way back into trust just like you behaved your way out of trust, and so I’ll give you a five behaviors that you can do as a leader or as an organization to regain trust, and again, it’s not easy and words alone are in, are necessary, but they’re insufficient. It’s got to translate into behavior, into actions. So the First is, is kind of confronted the reality that you’ve lost trust. Too often people are ignoring it, denying it, evading it. They’re just skirting the issue and you can’t solve a problem. You don’t understand. You’ve got to confront the reality. We lost trust. Second, you got to own it. I call that practicing accountability. You own it. You take responsibility. It’s hard to restore trust with another person when you’re saying, hey, it’s not my fault, but it rather, when you own it, say, this is my fault, you know, we’ve lost. Trust is my fault. I own it. I’m going to take the steps to restore it. Third, then right? The Rock. You make it right when you’re running, make a mistake. You apologize. You make restitution. The legal concept of May call you do you need to do to right the wrong and as best you can. Forth, now you’ve got to kind of re-clarify expectations going forward of how you’re going to behave your way back into trust and you say, so, hey, so going forward, here’s what I’m going to do. I’m going to try to make it up in these ways, but make a commitment. Going to keep it. If I talked to you in a tuck straight, if I have an agenda, going to be open and transparent about it. Uh, you know, I tell people what I’m going to do, I clarify expectations. And then most importantly, the last behavior, I do what I say I’m going to do, I behave my way back into trust just like a behavioral way out of trust and, the fact is, you can move the needle on it. It’s learnable and it’s recoverable. It’s not easy. And there might be some situations where you don’t have a chance to recover it because people don’t give you the chance, but in most situations, you can behavior way back into trust. It’s like you behaved your way out of trust, but it has to translate into behavior, not just in the words. So that’s the key principle. You can’t talk your way out of a problem. You behaved your way into yet the behavior way back into trust. And I’ve given you a few key behaviors of taking responsibility, owning it, riding the wrong clarifying expectations, and then keeping the commitment, doing what you say you’re going to do to regain, restore that trust. I’ve seen it happen with teams, with people, with organizations where they’ve regained tip cross when it had been lost. Gene: That is fantastic because you know, sometimes we just need a playbook and the playbook that you’re offering here pretty, very straightforward in. And it’s a little bit different than what a lot of people think that they try to apologize and must move on. But that’s like the very, very, very, very, very, very minimum. If you were trying to ribbing, regain trust, so I appreciate the five steps here. Gene: When people are trying to regain trust where do they get lost the most? Like which one of these areas do they kind of going to skip over? Stephen: Yeah, I think to two key areas. The first is that they’re still not owning it, finger pointing, blaming, explaining why and the problem is, if I’m on their side, I’m hearing what I’m saying this, these are excuses not to take responsibility on this. And, uh, and if, if everyone’s pointing and blaming, you’re playing the blame game, I don’t feel like you get it. You’re responsible, you’re owning it and you’re gonna you’re gonna make it right. So, you know, so often people just, they want to avoid feeling like they made the mistake. But Gosh, if you’ve lost the tragic loss of trust, own it, take responsibility for it. Then I think the next key thing is that people just kind of give the words and not enough of the actions and it’s got to translate into behavior. And, too often people will say, well, Gosh, you know, I took responsibility, I owned it and I told them, you know, I’m sorry, yeah, but have I behaved my way back into trust and that will take time. I’ve got to make a commitment and keep it, make another commitment, keep. I got to repeat that process. I got to behave my way out of it, just like be, I behave my way into it. And so I’ll tell you what, I’ll give you an illustration of this, but my son, another Stephen Covey, so when he turned 16, he could drive, you know, and he’s excited. I did. But, uh, within one month of driving he gets pulled over for going 83 miles an hour in a 25 mile an hour zone and that so the judge fined him $555, but did not take away his license. We were surprised. So my wife and I, we took away his license and we, you know, we kind of set some rules any violating the rules and uh, and he was embarrassed with his friends, you know, used to drive, I can’t drive and insights, but several months went by and then he came back to me and said, Dad, I’m ready to drive again. And I, and I asked her, are you clear about the rules? And he said, I’ve never been more clear about anything my life. He had a great ending from that time for. Because let me tell you what happens. My son took responsibility, he owned it. He, demonstrated this and he is sought and how we, how responsible he was. And, and it was demonstrated over time and is, you know, he’d go with friends and his friends’ parents would ask, hey, where you’re going? And they might hear, don’t worry mom, don’t worry dad. We’re going with Covey. And that means we are driving way below the speed limit. We’re wearing seat belts, were really safe. This is no fun at all. But he earned that reputation. He behaved himself out of the problem that he behaved yourself into. It took time, but I’ll tell you what today my trust is higher than it ever was. You know, you’re not only restored, it, increased it how through his behavior and that’s the number one learning is that you’ve got to be paved your way back into dress, not just talk. Right? Gene: So Stephen, you mentioned something there and the story was a really great example of this, and I’ve said this with two people before. It’s like that whole process of regaining trust. The other side of that could actually deepen the relationship because you have demonstrated that when things break down the kind of person are the character you have, you’re willing to do this. I mean, would you agree with your research and what you’re seeing? Stephen: Absolutely. It that not only could you regain and Mr Trust, you could move it to a higher level and strengthen the relationship. People see your character come through, be manifest in those hard times where rather than finger pointing, you took responsibility and rather than just talking about it, you acted upon it. And instead of me, they said this is a person, a team, an organization I can trust, and I’ve seen this happen where somebody makes a mistake, they lose some trust, but how they responded to it, they actually gained more trust and improve the relationship. And so, so last press is actually, it also can be an opportunity to grow, to expand the relationship. Now I don’t recommend it as a strategy, diluted stress with the idea because you may not get a chance, but absolutely you can solidify that. Let me give you a business example. I saw this happen a while ago, where know jet blue, there was an ice storm on the east coast and it affected all the airlines, but jet blue is really impacted. And, and uh, and they came out and they owned it and they said, look, we had operational snafus. People were stranded on planes on the ground. And they owned, it took responsibility. They came out with a customer bill of Rights So Customer, you have rights. That includes remuneration. When certain things happen, they owned it. It took responsibility for it. They declared a customer bill of rights, including compensation, and they behaved their way back into greater trust and they didn’t have to do any of this, but they chose to do it and they built even higher trust with their customers. So is it easy? No, but is it possible? Yes. How do you do it again, through your behavior? Now the words are helpful because they signal what you’re going to do it. Tell them what you’re going to do and then you do what you say you’re going to do. That builds trust faster and if you just kind of always delivered but never tell them has standing for something, having to promise, putting that out there and then delivered on that promise builds trust. And, uh, and so that’s how you do it and it’s practical. And I’ll tell you what, a old trust world, we all need to maybe be aware that you know, that trust can be restored because otherwise we’re circling the drains. All of us, we’ve all fallen short. I know I have an and most organizations have as well. Gene: Well, you know, Steven, you’ve probably listened to a few episodes. I know you rattled off a few of the recent ones we’ve had, so I really appreciate that. We always have a practical maximum. We’re here. And so I was thinking about what I want to ask you based on us talking about the steps to regain trust and this is very, very short, you know, short and sweet here. What are the words you use with someone if you want to regain trust and what are the guidelines around that? Like obviously you probably can’t do this through a text message and a lot of people think you probably can, but what are the, what are the words that you would choose to invite someone new that the initial conversation and what are the guidelines around. Stephen: Yeah, well the main guideline I would say would be this is his take personal responsibility for it. Go direct to the person and, and a is better if you can go. If you can go face to face or at least voice to voice where you can connect with them. And right out of the gates, take responsibility. Own it. It’s amazing what that does to people versus just giving all the reasons why there’s excuses and get things getting in the way that people don’t feel like, are you really sure that you’re responsible for this? They just got this flat out. Just say, you know what? I fell short. I’ve lost your trust and I want to do, I want to make this right. And then I want to do what I ever I need to do to behave my way back into your trust. I’m not asking you just to give it. I’m asking you to give me the opportunity to behave my way back into it. I want to earn it and I want to be the person that you can have confidence in that you had made a mistake. And then I rented the wrong. And then going forward, you know that I’m going to always do the right thing. And, you know, you’re really just asking for the opportunity. So the clear, your intent, I want to make it right. And then you signal your behavior, so here’s why I’m going to do, and then you do what you say you’re going to do and you behave your way back into trust. And so those are some practical things to do, you know. So if I can summarize those three things, declare your intent to make it right, signaling your behavior, tell them what you’re going to do, and then do what you say you’re going to do. Behavioral back into trust. Gene: I’m going to add all this too, especially for the millennials out there. You can’t just do all this through a text message. It just not the same. Stephen: Go face to face when you can. It’s powerful. It conveys caring and meaning. Text can be efficient, but it’s not the best place for an apology. And for writing. The best place to do that is to try to do it directly with the person. Gene: Right text is the way you set up that meeting, not the way you handle it. Um, all right, so this is a pretty good guidebook for any leader out there that would love for their team to rebuild trust in any way. So if you mess up, okay, you can use this or you can send us and talk about it with your team, like hey, when we talk, when we actually mess up in the future, we want to build a culture around frost. This is, one of the tools we can hear. So thank you for being here. Thanks for being a part of leaders in the trenches. Stephen: Absolutely. Thanks so much, Gene. Great to be with you. Gene Hammett: Alright, great. Interview here. I so love what I do. I get to talk about people all the time and I get to talk to them about the things that are really exciting them. I think you saw today when Stephen talked about trust and he talked about the things that are really driving as a business, so hopefully, you were making progress through a lot of the information we’re putting out here to be a better leader. And if you were thinking about being a better leader, you want to make sure your culture is right on point. We have something called a growth culture scorecard. If you wanted to see where you score, just go to www.genehammett.com/culture and you can actually get exactly where you score right now and then if you want to take it a step further, you can share that with your friends inside the organization and see if there is a gap between where they see the culture are is and where you are. Right? If you want to do that, just go to www.genehammett.com/culture. As always, lead with courage and stay tuned next time. I have noticed that many people want to understand trust. More importantly, people want to know how to regain trust in a simple framework. How to regain trust with Dr. Covey gives you key insights on how you can rebuild it.